I was walking through Zellers and, it being November and all, they had Christmas carols playing. 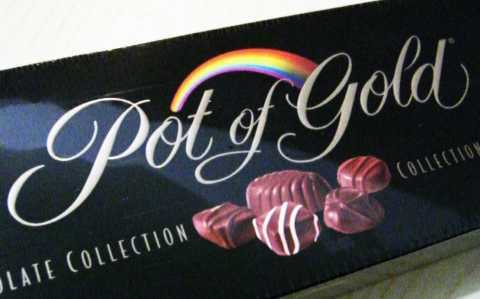 As I walked past a stack of Pot of Gold chocolates, I had a sudden image of friends and family all cozy around a fireplace, in big knitted sweaters and garland on the mantle, passing a box of chocolates around. What was I suppose to do about that? Seriously. I had to buy the chocolates. I can’t eat them until December though, since even though they aren’t technically Christmas candy, I bought them with that spirit in mind, and in my family we aren’t allowed to put up the decorations or play Christmas music until December. Besides, I’m saving them until I have a fireplace and a bunch of friends and family in big knitted sweaters to share them with. so i just randomly found this site when i was looking for fraggle rock and decided to say hey. where are you studying at? Thanks for your comment. I always love to hear from Fraggle Rock fans especially :) To answer your question, I’m studying at McGill in Montreal.